Black Sabbath, Evolutionism, Faith, Heaven, Heroism, Hope, King James Bible, Liberate your Mind!, Mercy, Revelation, Salvation, Satan Laughing Spreads His Wings, Theism, There is a God! That Christ’s atonement for sin on the Cross is a very unpleasant Business/ Idea I agree… yet this does not make it objectively false. Indeed The Cross makes us realise just how costly our sins are and how serious God is about judgement. 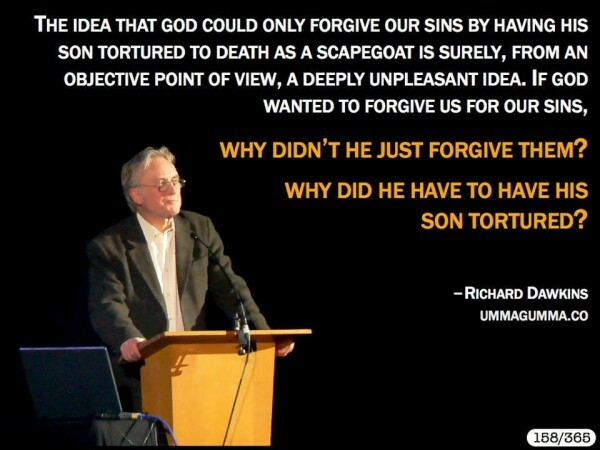 Dawkins obviously does not consider his own sins… are that bad. It matters little if we may find Christ’s substitutional atonement on the cross an offensive proposition. God chose a means of salvation and the restoration of our communion with him which puts all human beings on the same level. Receiving Salvation is not a vain self-righteous act, not a reward, or an intellectual achievement. To receive Christ We must humble ourselves… and admit our personal moral guilt to be saved. This is what Proud and Vainglorious Toffs like Dawkins hate! The Idea that they must give account of themselves to God is bad enough… but that they must do so on the same level as the rest of us … one of the great unwashed… is unbearable! St Paul Roman’s 3vs 23. Dawkins exposes his great ignorance of Religion… in particular the Theology… the principles which underpin Christ and the Cross. He actually proves he has not even bothered to learn even the basics about the Religion he spends his life attacking. The need for Christ was immediate following Adams fall, having broken his covenant with God, the punishment of which was Death. Sin and Evil are why we have Wars, Murders, Rapes, Poverty, Lies, Perversions, Robberies, extortions, Tyrannies, etc etc. This is why God will judge with wrath… for Justice’s sake! st Paul. Roman’s 10vs 13. Previous PostEvolutionary ‘Mumbo Jumbo’ of the the Week. “Why Do Humans Cry?”Next PostWhy must we die? Dawkins actually asks a very good question. Unfortunately I don’t think it is one that Western Christianity can ever give a good answer to, being as it is, in thrall to the false doctrine of Satisfaction. Unfortunately this is the curse of both Protestant and Catholic theology. This idea that God is a simmering volcano that will erupt unless we throw things into it is full of problems, and just plays into the hands of sneering atheists like Dawkins. The Eastern Church, on the other hand, states that God is Love. Love is only possible with free will, which mankind has used to separate itself from God. The consequence of separation from God is death (it is not some punishment God made up, it’s just a logical consequence of the nature of the created universe). So the person of Jesus Christ, His incarnation, death and resurrection represent God reuniting us to Himself, and the defeat of death. To simply not bother to do so would not be love. Nor would a “finger click” of “forgiveness”, since love involves sacrifice. Love necessitates Jesus and his saving acts. The only other alternative would be to deprive us of our free will, which would not be love either. 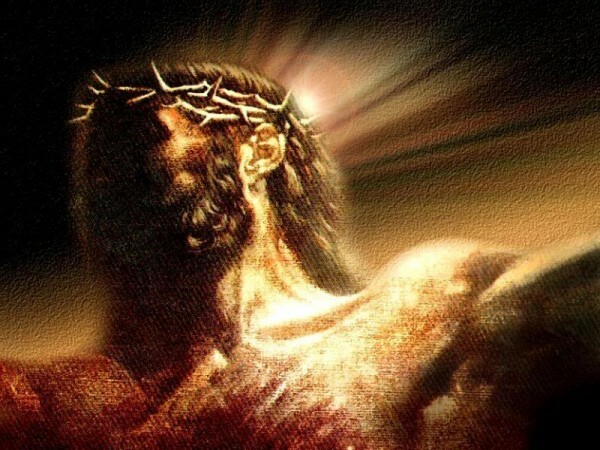 Sin is not a crime for which retribution or punishment must be extracted to satisfy God, rather it is a sickness which separates us from God and causes our death, and only seeking the grace of God through Jesus Christ can heal us of it and return us to a state of oneness with God. Some better clarification on this subject can be found here. It must be wonderful to be so wise as to be able to correct the Divine revelation! I must however disagree with your lofty opinion. I am very ‘satisfied’ with my explanation and Doctrine… though it was only partially expounded here. *The Wages of Sin is Death*. You are absolutely wrong about saying sin is just about separation from God, and not Judgement and Justice. It’s not just my opinion, it’s the doctrine of the Orthodox Church for two thousand years. It is the original view of Christ’s saving acts. Satisfaction only dates back to Anselm – 900 years, which you would know if you read the link I included. Simply quoting scripture at me is begging the question. The verses you quote do not imply Satisfaction as a doctrine. Judgment, yes, wrath yes, but not as appeasement. See Job 35:6-8. People separate themselves from God and incur His wrath by their own choices and decisions. This happens because God is Love and cannot be united with the opposite of Love, which is sin. The sin does not create a debt to God to be paid off. Instead, what is united with God will live, and what is separate will die. God’s wrath and judgment is our doing, not His. The wages of sin are death because we have worked to separate ourselves, and we get what we seek. To imply God separates from Himself by sacrificing Himself to appease Himself is indeed an odd idea, and in fact, an heretical one, because it separates the Holy Trinity. Dawkins is right to point out that it doesn’t make sense, and the Church was, and is, right to reject the idea. I suggest you read some Early Church Fathers, especially John Chrysostom, for a better education on these matters. Even if you don’t change your mind on Satisfaction, it would help to round out your ideas rather than simply quoting scripture and assuming that they draw the conclusion you want. How many steps did you complete to receive the “free gift” of Salvation? Is this a “free gift”? 1. apologize for his bad behavior and sincerely mean it. 2. he must commit to change his ways and follow MY ways for the rest of his life. 3. he must make a decision that he WANTS my gift. 4. he must then approach me, hold out his hands, ask me for the gift, and cooperate with me, as I place the gift into his hands. If he does all this, he will receive his gift. But…if he chooses to reject my gift, I will damn him to HELL! Now is this “gift” really a gift…or a REWARD for making the right decision? No, that is NOT a gift! This is a gift: “Dear Son, I have a gift for you. Here it is. I love you more than words can describe”, and then I place the gift in my son’s lap. No strings attached. The gift is his. He did nothing to receive it. I did everything. THAT is a free gift! So what is God’s free gift? It is the whole salvation package: faith, belief, repentance, forgiveness of sins, atonement, and eternal life. It is ALL free… to those whom God has predestined, before the world existed, for reasons we do not know, to be his children. Gary…. The Gospel of grace is a free gift. It does not trade you salvation in exchange for anything whatsoever. It does not demand that you serve and obey God hence forward. Any gift must be accepted. A gift will always require our participation. Your son still has to tear off the wrapping and make use of the gift. Or he could leave it unwrapped, sitting there, and resume doing what he was doing before. The gift we are given is Jesus, nothing more and nothing less. He is the Way to God. But this gift, unused, will not help us or save us. To suggest otherwise is like saying that having a bottle of ibuprofen pills in your house will cure your headache simply by its presence, or even that the mere existence of ibuprofen somewhere out there will be sufficient. No. You have to take the pills! If sin is our headache, simply knowing that “the pill” exists will not set us free from sin. Our faith has to be lived for it to work. Sinners do NOT make a decision for God. God makes the decision for the sinner. Decision theology is not scriptural. If salvation requires your assistance or cooperation before it is really yours…it is NOT a free gift! There is no where in the Bible that states that a sinner must “unwrap” his free gift before it becomes his. God’s gifts do not require unwrapping. God doesn’t use wrapping paper! He predestined before the world existed that you would be his child. His gift to you comes with no strings attached…and no wrapping paper to hide it. You are using the rules of human logic and reason to understand a supernatural event. God is not limited by man’s reason and logic. Sinners do NOT make a decision for God. Well that’s Billy Graham’s entire career wasted then. Many of these folk were disciples of the original Apostles and were martyred for their beliefs. Even if this were not so, predestination (at least in any other sense that God created us of a certain nature and foreknows our actions) just makes no sense in light of nearly all the teachings of the Church through the Holy Scriptures. For starters, it makes prayer completely redundant. What is the point of praying if God has decided everything beforehand? It would also mean that God creates and pre-ordains sin, a heresy. It denies all culpability for sin, and that the separation between us and God that results is ephmeral and not real – it’s predestined! It’s a big trick, an illusion that God plays, because God set us up to sin. Why would Jesus pray for Peter, that his faith would not fail, if Peter was predestined? Why would Jesus choose Judas, and have him run around the countryside preaching, healing and working miracles, if his ultimate fate was sealed? Why would Paul tell Timothy that “God our Savior… desires all men to be saved and to come to the knowledge of the truth” if God instead creates people predestined to eternal separation from Him? Predestination (and its bedfellow Assurance) gives mankind no responsibility for its own sins. It’s all a creation of God, even the bad stuff. It fits right in with that other heresy, Satisfaction, whereupon Protestants will deign to tell us that salvation is a contract not even requiring our signature, it’s a done deal, and the separation that we have from God because of our sins is simply something we have to overcome by intellectual exercises “because Jesus has already done all the work and paid the price”. But not even Protestants truly believe that! If they did, they would simply stop going to church or being active in their faith in any way. In fact, that’s what a lot of them do! It’s what I used to do! And it didn’t save me in any real or genuine way. Without Assurance it can appear that the only alternative is salvation based on human effort. But of course, the opposite is true, because in rejecting predestined assurance, we are no longer presuming our future faithfulness, but relying on God’s grace to maintain our faithfulness. And God’s grace is assured. His promises are faithful and true. We stop relying on ourselves, or an inaccurate view of ourselves, and start relying completely on Jesus this way. This is genuine Christianity – a saving faith – a journey to a restored relationship with God – not through our own effort, but through constantly seeking the Holy Spirit in our lives. Your assertion that “you are using the rules of human logic and reason to understand a supernatural event… God is not limited by man’s reason and logic” is a copout. You could use it for practically every theological argument under the sun that you happen to disagree with. At some point, we all have to engage our brain and use discernment. God created logic and reason for that purpose.